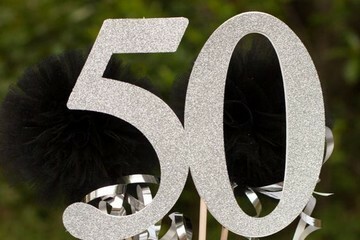 Your 50th birthday is a big milestone, where you're wrapping up one fantastic chapter of your life and entering into a whole new exciting one. As the new decade and its adventures approaches closer, you might be curious to know what kind of company you're in when it comes to turning 50, outside of your own network. There are a handful of Hollywood stars celebrating their own 50th birthday in 2019, whether you realize it or not. Stars like Jennifer Aniston, Tyler Perry, and Jennifer Lopez are hitting the 5-0 mark. (Yes, JLo is really going to be 50, even if her physique suggests she's closer to 25). While you might not be celebrating this milestone on a private yacht or red carpet like these celebs, you'll enjoy finding out which big names are turning 50 this year so you can celebrate along with them, from afar at least.